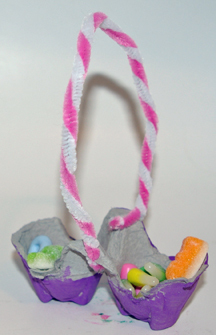 Here’s another take on the egg carton Easter basket, this time using 2 sections from the carton. Fill with 2 kinds of candy or treats! 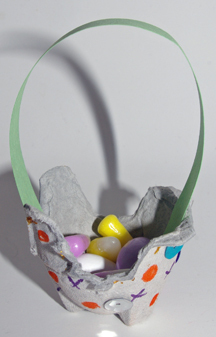 What You Need: egg cartons; paint and other decorations; 2 pipe cleaners; scissors. How to Make It: Adult cuts out 2 sections of egg carton, keeping them together. Let kids paint and otherwise decorate the baskets. Once dry, adult pokes holes in either side of basket and attach 2 pipe cleaners, twisted together for handle. 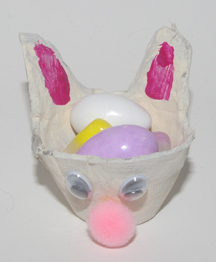 Pre-cut a bunch of egg carton cups, set out random craft supplies and let kids make their own little Easter baskets! What You Need: Egg cartons, construction paper for handle; various decorations such as markers, sequins and glitter. How to Make It: Adult cuts out egg carton sections. Cut construction paper handle and attach with glue or brads. Decorate with paints, sequins, markers, etc. 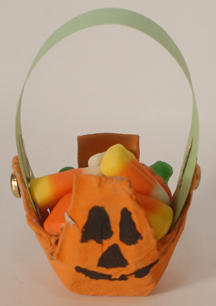 Preschoolers can make their own little pumpkin party favors to hold treats for a class party. Painting a jack o’ lantern face is optional! What You Need: Egg carton cup (adult should pre-cut for little kids); 3/4″ wide strip of green construction paper; orange and black tempera paint; large and small paint brushes; hole punch and 2 office brads (or just staple handle on). How You Make It: Paint egg carton cup orange, let dry and paint jack o’ lantern face if you’d like. Poke a hole on each side of the top of the cup and through the paper strip and use office brads to attach handle. Once dry, fill it with treats! Great for Halloween or a spider unit in school, these spiders are quick and fun to make. If you want, you can twist one of the pipe cleaner legs to make the spider “hold” a name to identify a child’s desk or as a placecard at a Halloween party. What You Need: 1 “cup” section from egg carton; black tempera paint; 2 black pipe cleaners; 2 googly eyes; paintbrush; glue; 1/8″ hole punch or poking tool. How You Make It: Adults should precut egg carton and pipe cleaners and poke the leg holes for littler kids. Paint egg carton section black and let dry. Poke or punch four holes on each of two sides of the egg carton cup. Cut each pipe cleaner in half, poke in one hole and out the opposite side and bend into leg shapes. Use glue to add googly eyes.